Khat – is it more coffee or cocaine? The narcotic leaf is a time-honored tradition in Africa but illegal in the U.S., where demand is groWASHINGTON — In the heart of the Ethiopian community here, a group of friends gathered after work in an office to chew on dried khat leaves before going home to their wives and children. Sweet tea and sodas stood on a circular wooden table between green mounds of the plant, a mild narcotic grown in the Horn of Africa. bolster their economies. Khat is Ethiopia’s second largest export behind coffee. 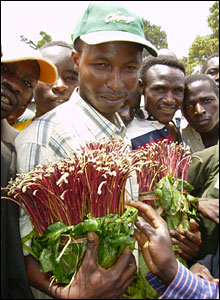 The Kenyan farmers who grow the mild stimulant khat, which is banned in some countries, have had a tough year. Exports dropped by 40% when its consumption was banned in Somalia, their main market, by Islamists during their six-month rule of the south and centre of that country. But after Somalia’s transitional government, backed by Ethiopian soldiers, defeated the Islamists, daily khat flights from Kenya to Somalia have resumed.